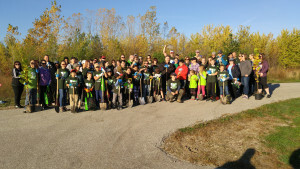 On Sunday, 22 October, TD Bank sponsored their TD Trees Day program by inviting our Windsor-Essex community to help TD employees plant trees. Groups that participated included: Essex County Nature, Code Green – Caesars Windsor, Rotary Club of LaSalle Centennial, Essex County Geocachers, University of Windsor Students, the Detroit River Canadian Cleanup, Unifor Local 200 Retirees and the Little River Enhancement Group. The planting site is located in the Detroit River Watershed in East Windsor’s Little River Corridor Park. This is the same site that our community planted to celebrate Earth Day 2017. We enjoyed a typical Autumn day: a mostly sunny sky with occasional Cirrus clouds, temperatures in the morning of 12 Celsius increasing to 21 C by noon. There was a slight breeze (23 km/ h), which made the planting pleasurable. Over 60 eager volunteers participated by digging holes; planting and mulching 300 trees! Volunteers started planting at 9:30 a.m. and the job was completed at 11:15 a.m., before the scheduled end time, Well Done! 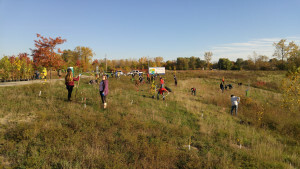 The species of trees that we planted included Burr Oak, Swamp White Oak, Red Oak, Cottonwood, American Elm, Basswood, Pin Oak, Hackberry, and American Sycamore. The Little River Enhancement Group would like to thank TD Bank and the Essex Region Conservation Authority/ Detroit River Canadian Cleanup for planning this community event. 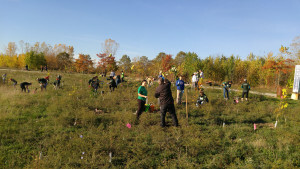 Our goal to improve the ecosystem health of the Detroit River Watershed has benefited from the TD Tree Day volunteer efforts.